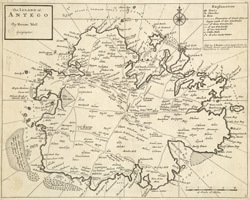 This early eighteenth century map of the island of Antigua (c.1732) by Herman Moll is a good example of the type of larger scale and more detailed maps of the individual islands of the West Indies which began to be produced from about 1700. This map is about 1 inch = 1 1/4 miles (c.1: 50,000). It is the second of three editions of the map which was published in Moll's Atlas Minor and is typical of his work. Moll moved to England in the 1670s from Germany. He started his own business as a map publisher and became well known for the quality of his separate maps and atlases.